[July 13, 2014] “War solves nothing.” Well … at least that is what we’ve been told in America over and again many times. By that logic, both World Wars and the Korean War should not have been fought. America was a big participant and, of course, neither war was started by us. Yet, today’s de facto policy of the United States is to immediately call for a ceasefire and pressure the warring parties to stop the fighting. I am no advocate of war. My personal experience of three years in combat makes me especially cognizant of the costs in lives and national treasure when war occurs. There are times, however, when war is the only realistic choice to stop evil. Yes, senior leaders must be capable of recognizing evil and taking action to stop it from spreading. In WWII, surrender had to be “unconditional” for Japan, Germany, and Italy. This meant the total elimination of the threat. It worked. The Middle East has been in a state of deadly conflict for millennia. What the United States does in applying our de facto ceasefire policy will have little consequence on either that state of affairs or the outcomes. What can be done is to stand with our allies if they are being attacked, by being clear on our support, and through action when called upon. 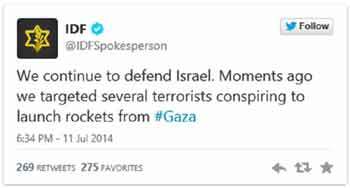 The Israel Defense Force (IDF) has its own twitter account. The recent rocket attacks by Hamas on the civilian population in Israel continue to escalate. I wrote about it earlier (links here and here). Today, we hear that the United States has issued a call for a ceasefire from the Department of State. In most of the world, the strength of a nation is highly regarded and respected; as is honor in an individual. Ceasefires are a sign of the weak. When the U.S. calls for an immediate ceasefire, it shows three things to all sides of the conflict. First, it shows we only want to look good on the world stage. The appearance of goodness does not carry much respect from the rest of the world, although it may look like a good thing at home in the United States. Second, it says the U.S. is not a serious ally or concerned about a real solution. And third, it shows weakness. None of this is good. That is why America needs a firm, clear policy in the Middle East; a policy based on those principles of freedom and democracy that has worked for over two centuries. Oh, when people say that “war solves nothing,” then ask them why it is so popular. Answer: it’s popular because it works.